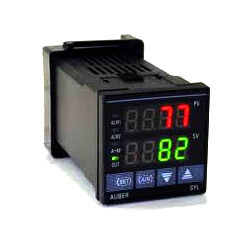 We are enlisted amongst the well-known names in the industry offering quality assured range of Temperature Controller. Our entire product range is quality approved and is available with application specific designs. They are automatically controlled and require minimum maintenance. These products are durable and reliable in nature and require minimum maintenance. Sun Electro that started its business operations in the year 2004 has emerged as a prominent manufacturer and supplier of precision engineered Sensing Devices, Flow Pressure Valves, Heaters, Controlling Devices and Measuring Devices. Established as a Sole Proprietorship business venture at Chandigarh, we have carved a prominent ourselves position not only across north India but throughout the entire nation. Owing to the support of and leadership of our owner Mr. Rajiv Ahuja, we have extended our product range. Our exclusive product range include Nozzle Heaters, Ceramic Barrel Heaters, Cartridge Mould Heaters, Strip Heaters, Porcelain Heaters, Resistance Temperature Detectors, Oil Heaters, Temperature Controllers, Temperature Transmitters, Ampere Hour Meters, Digital Temperature Controllers, Temperature Gauges, Control Panels and more.